London, May 17th, 2017 – When you are looking for the ultimate tough, go-anywhere camera to capture the highlights of your latest adventure, the best in class just got better. 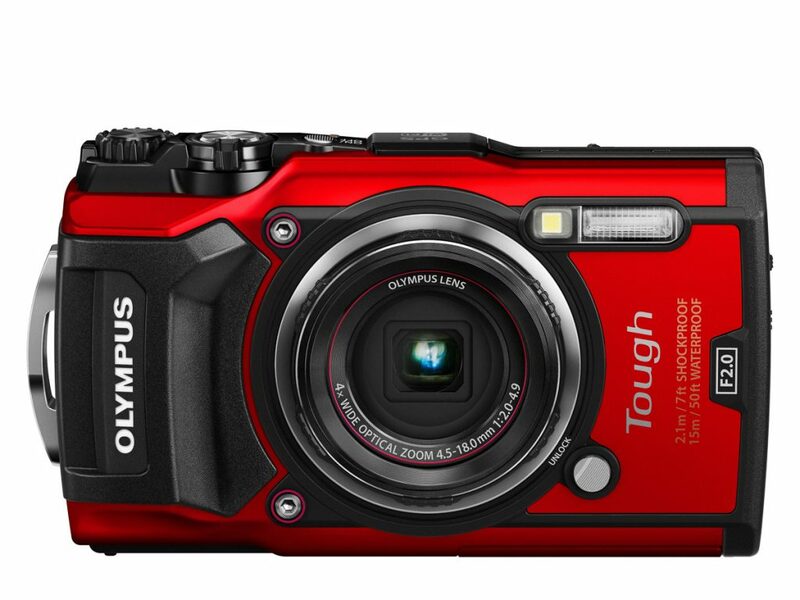 With the TG-5, Olympus announces their latest flagship Tough! camera, and it comes with some serious enhancements. The class leading super bright 25-100mm* 1:2.0 lens is married to an all new sensor and the latest TruePic VIII image processor that deliver significant improvements in speed and still image quality in all conditions, while video now boasts 4K and 120FPS Full HD high-speed movies for better slow motion quality. Added to this are new easy to access controls and dual pane anti-fog glass. As Tough!’s tend to be used when the elements are at their harshest, this matters, so for all those who want to share spectacular evidence of their exploits this summer: Look no further than the new Tough! TG-5 available in red or black from mid June at £399.99. There are plenty of “action” cameras but none that quite deliver the still image quality and convenience of the TG-5. In the middle of a tackle-anything adventure, your camera needs to be light and small enough not to get in your way, yet be able to take punishment so you don’t worry. Throw a TG-5 in a canoe with water sloshing – no problem. Stand on it in hiking boots – a walk in the park. Drop one from head height onto a boulder – all in a day’s shoot. Regularly awarded best in class since the introduction of the TG-1 in 2012, the flagship Olympus Tough! series has become the go-to rugged camera for die hard adventurists the world over. A classic blend of carry-anywhere size and hard as nails durability that Olympus pioneered, the TG-5 now heralds levels in image quality and video performance to add to a reputation for robust construction. “Our priority with the TG-5 was to improve overall image quality in a wider range of conditions and to enhance the adventure capturing capabilities of the camera. Customer feedback told us that Tough! cameras are used in situations that are challenging both physically and photographically. The new sensor has a lower pixel count than the previous model, yet when combined with the latest image processor from our pro flagship OM-D E-M1 Mark II, gives better image quality than before with enhanced dynamic range and improved response time. The TG-5 has five main strengths. Its ultra-bright lens, its Variable Macro system, its range of accessories and its field sensor system combined with built-in WiFi for tracking and transferring data to smartphones. That’s four. Number five is the now legendary toughness. The TG-5 is shockproof to a height of 2.1 metres***, crushproof to a weight of 100kg***, freezeproof down to -10°C***, dustproof, and waterproof to a depth of 15m without a special underwater housing***. With the PT-058 underwater casing (sold separately), images and movies can even be captured in depths of up to 45 metres. The super-bright 25-100mm* lens has a 1:2.0 maximum aperture at wide zoom settings, which means the TG-5 can capture colourful, low-noise shots in light-starved environments where fast shutter speeds and low ISO settings are a must: For example 15m underwater, with no need for a housing or extra light. Divers will not only profit from the built-in manometer but also from Underwater HDR to enhance areas of light and shadow, AF Area to shift the focus within the frame and the glove-friendly customizable mode dial together with a new control wheel. For spectacular nature shots, the TG-5 has an advanced, four-mode Variable Macro system, with Microscope, Microscope Control, Focus Bracketing and Focus Stacking Mode. The latter works without software, which is unique in this camera category. To maximise realism and colours and minimise noise, the TG-5 also supports RAW files. The TG-5 is a comprehensive system for adventurous people with imaging ambitions to match. The great-value price includes a six-month warranty extension**** if new owners register their camera at MyOlympus. > CHS-09 Floating Handstrap in red for a sporty and highly visible way to hold onto or relocate your Tough! Product specifications are subject to change without notice. Please check the Olympus website at http://www.olympus-europa.com/ for the latest specifications. *** Waterproof according to IEC standard publication 529 IPX8. Shockproof figures compliant with MIL-STD810F (Olympus test conditions). Freezeproof and crushproof according to Olympus test conditions. **** Six months on top of the statutory warranty in the country of purchase.